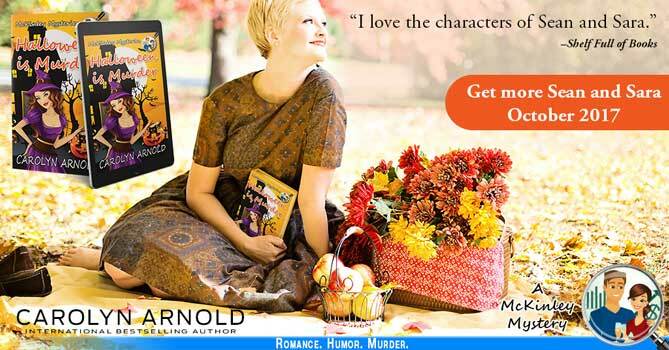 Cozy mysteries are my new addiction. 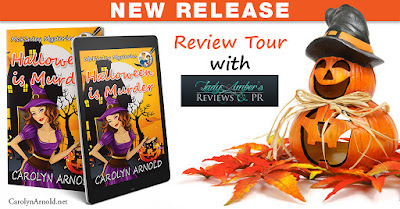 This is my first book by Carolyn Arnold and after completing it her other works were immediately added to my TBR list. 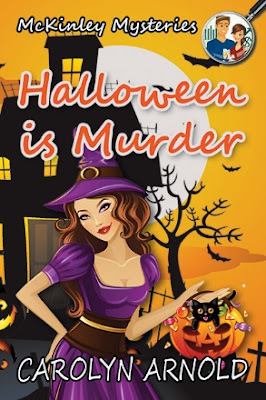 Even though Halloween is Murder is part of the McKinley Series, it can be read as a standalone. I didn't have any issues with following along or understanding any reference to past things. These characters are well defined and the story is fast paced. I read it in 2 sittings. I love how compassionate and giving Sean and Sara are. The world could use more people like them. I was surprised by "who done it." I like that the author kept throwing in new suspects. And donât forget to sign up for her newsletter for up-to-date information on release and special offers at http://carolynarnold.net/newsletters. SARAâS HEART RATE TICKED UP a few notches at Marieâs assured conclusion that someone had killed Chloe. She could feel Sean staring at her, but she refused to look at him. She knew that his eyes would be telling her not to get attached to investigating this case. Besides, he had said they could look into Chloeâs death more, which hadnât been a commitment, she knew, but sheâd taken it as his word. Even a little investigating was a step in the direction she wanted to go. And just because she had a gut feeling about Chloeâs death didnât mean sheâd lost all objectivity. âWhy do you think someone killed her?â Sara asked. âItâs justâ¦ None of this feels right.â Marie picked at her purse strap, its fabric frayed and threads poking out. Probably a nervous habit of hers. Sara gave Marie the once-over. For someone who lived in a nice neighborhood, Marieâs clothing and accessories didnât speak of wealth. It also didnât seem Chloeâs sense of style was a trait her sister shared. âAnd why doesnât it feel right?â Sean, a skeptic if ever there was one, pressed. Sara looked over at him. It didnât seem to matter how long they worked together; he would never fully cave to the weight she put on intuition. âWe spoke with Jacksonââ Sean started. âAnd Chloeâs health was excellent. We have no history of disease or people justââ Marie averted her eyes ââdropping dead in our family. Our grandparents lived into their eighties on both sides. Now, our parents are both dead, but they were in a car accident.â She added the latter part quickly. âDo you have any other siblings?â Sara asked, though she only remembered reading that Chloe had a sister. Marie shook her head. âIt was justâ¦â She cupped the sides of her face and pinched her eyes shut. Tears squeezed out from the corners, falling down her cheeks without apology. A knot balled in Saraâs chest, and she took a shallow breath. She was getting too caught up emotionallyâagain. And taking on the grief of others wasnât healthy. At least so far with this case, sheâd managed to stuff the feelings deep down inside. But sheâd be lying if she said she didnât fear that one day theyâd bubble to the surface all at once.